Sad news over the past couple of weeks for Trucker Diablo fans. 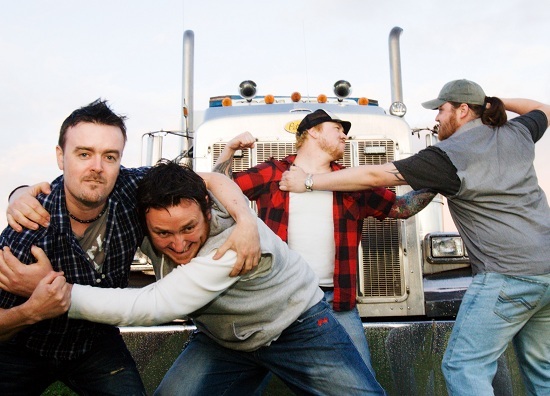 The big truck have announced Simon Haddock has left the band. Simon is leaving for personal reasons and they all remain friends which is refreshing, but unfortunate news. The original line-up played their last show together at the Diamond Rock club last weekend (Feb 8th) and Trucker are now on the hunt for Simon’s replacement. So think you have what it takes? 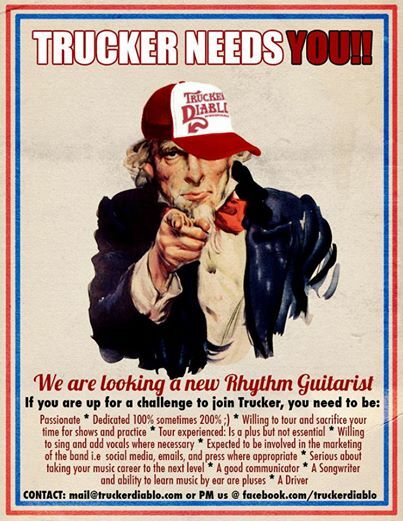 Trucker are looking and it could be you (and you might have found out here and when Trucker are massively famous you’ll be like, Oh forget you Rolling Stone – the TT gets our attention first. ‘Hey TT’, you’ll say. ‘Come on tour with us while we support Motorhead‘. I’d be all cool at first, but I’d find a way to blow it sooner or later. Anyway – THEY WANT YOU! Simon, very sad to hear you’re going but your reasons are obviously very understandable. I’ve enjoyed the music you made with the guys and wish you the very best for the future. Hopefully we’ll see you back with a guitar soon. This entry was posted on February 14, 2014 at 4:11 pm and is filed under Music, News with tags Simon Haddock, Trucker Diablo. You can follow any responses to this entry through the RSS 2.0 feed. You can leave a response, or trackback from your own site.